It is 1893 and the first generation of immigrants who came to America for the promise of free land and a good life for their children have finally achieved their dreams. They labored hard on the land and now have a bountiful heritage to pass on to the next generation. However, many of the young people aren't interested in becoming farmers--they have aspirations of their own. Thorliff Bjorklund has been writing stories and plays since he was a young boy and longs to attend college to study journalism. But his father has other plans for him and refuses to agree. 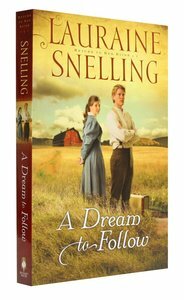 Thorliff is torn between love for his father and the pull of his dream. Must he choose between the two? - Publisher His dream is to become a journalist. Will his father give his blessing? Thorliff Bjorklund has been writing since he was a young boy and now longs to attend college to study journalism. But his father has other plans for him and refuses to agree. To make matters worse, the threat of a crop failure may mean there'll be no money for further schooling. Thorliff is torn between love for his father the pull of his dream. Most he choose between the two? Elizabeth Rogers has been raised in a life of privilege, yet she has an unwavering determination to become a doctor. Though she has the support of her family, society is not as kind, for it is nearly impossible for a woman to enter medical school. Will the Red River Valley nurture the dreams of its young--or will it fence them in? About "A Dream to Follow (#01 in Return To Red River Series)"
His dream is to become a journalist. Will his father give his blessing? Thorliff Bjorklund has been writing since he was a young boy and now longs to attend college to study journalism. But his father has other plans for him and refuses to agree. To make matters worse, the threat of a crop failure may mean there'll be no money for further schooling. Thorliff is torn between love for his father the pull of his dream. Most he choose between the two? Elizabeth Rogers has been raised in a life of privilege, yet she has an unwavering determination to become a doctor. Though she has the support of her family, society is not as kind, for it is nearly impossible for a woman to enter medical school. Will the Red River Valley nurture the dreams of its young--or will it fence them in?